The increasing population in Pima County has added considerable demand for recreational, educational and environmental programs and facilities. Because of the budget limitations of county funds, many of the existing facilities have failed to keep pace with those demands. 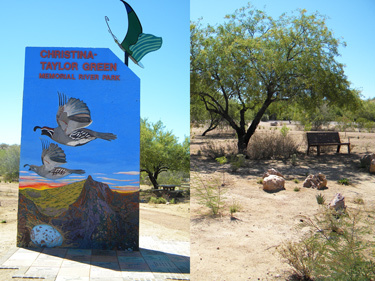 In the true meaning of public/private partnerships the Green Family approached Pima County with an idea to fund additional improvements at the Canada Del Oro Christina-Taylor Green Memorial River Park. The Green family asked Pima County if they could raise additional funds to improve approximately 2 acres of unimproved land at the corner of Shannon and Magee Roads. 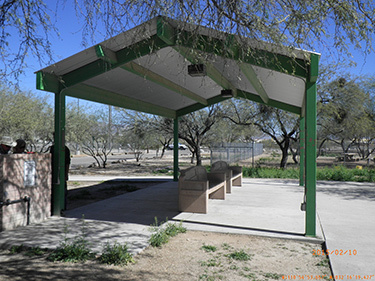 Pima County supported this endeavor and put them in contact with Parklands Foundation because the funding needed to be funneled through a non-profit tax-exempt organization. The improvements include a shaded central seating plaza; a bronze statue surrounded by a butterfly garden; botanical trails through native plants; a butterfly sculpture atop the monument and several benches to provide respite for Loop users. This project could not have been made possible without the generous support of the community. 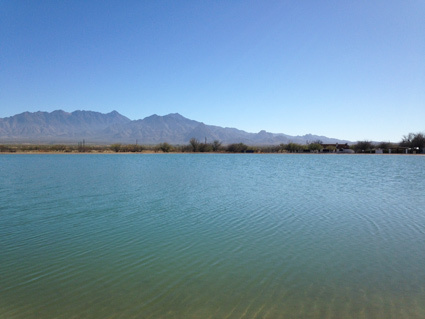 Pima County’s Regional Flood Control District has partnered with Natural Resources, Parks and Recreation to restore a 2.5 acre pond at Historic Canoa Ranch in Green Valley. The new pond will provide residents and visitors recreational opportunities, particularly birding and wildlife viewing. The features to be added around the pond include native trees and shrubs for increased wildlife habitat, a perimeter-walking path with benches and ramadas for shade and an area for small-scale special events. Paths will eventually connect the pond to the ranch complex, the habitat restoration area, pollinator garden, the Anza Trail, and the Santa Cruz River. Funding is needed to help build the path, ramadas and picnic benches. Parklands is seeking donations in the amount of $10,000 to convert a ramada at Brandi Fenton Memorial Park into a restroom. There are currently no restroom facilities convenient to the east side of the park. The new facilities will be located near the dog parks and basketball courts.